There are a variety of paint types of available on the market today. Many of them give different surface finishes, others are designed for a specific type of application or use. Selecting the correct paint type for your home may be confusing at first. However, when the project application and finish you would like is determined, it’s much easier to know which type of paint purchase. There are two specific types of paint available on the market today. There is solvent-based or oil paint and a water-based or latex paint. It’s important to know that oil based paints dry very slowly and may take up to 24 hours to completely dry. Latex paints dry much faster, but can have certain use limitations which we’ll discuss below. The appropriate clean up solvent for an oil-based paint is to use turpentine or paint thinner. Clean up for latex paint is just to use soap and water. If you’re painting the inside of your home it’s highly recommended to select a water based paint. 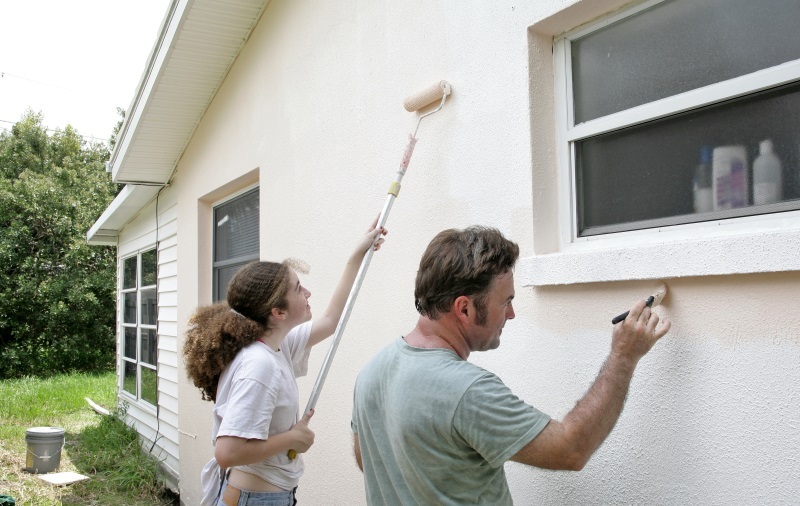 Using a solvent-based paint is often recommended for the exterior of your home. Different types of paint produce different finishes. Water based or solvent based paint offer unique finishes and sheens. Sheen is the term that describes the amount of light reflecting from the paint. Lower sheen paints are ideal for an interior and an exterior paint would want a lower stain resistance, using a paint with a higher, or shinier sheen. Glossy paint is easier to clean and tends to resist stains better than lower sheen paints. A gloss finish is perfect for bathrooms and kitchens. Most glossy paints are recommended to use on wood, baseboards, kitchen, and bathroom walls, they are also ideal for door jambs, and window casings. Unfortunately, there is a downside to using a glossy paint. The high sheen finish can highlight imperfections on the wall surface. High gloss paint is very reflective. They work well for highlighting specific details like trim or decorative molding. They’re also ideal and the best choice for doors and cabinets or any area that may have a high amount of traffic or be used often. Semi-gloss paint is also similar to gloss paint except they have a lower level of Sheen. So semi-gloss is very suitable for rooms that have high humidity and they may also be utilized for trim and casings. This way you can ensure maximum durability on your paint surface. Another type of paint finish is eggshell. Eggshell allows a smooth and low Sheen finish with good cleaning ability. Rooms that are done with a lower sheen are perfect for living room, dining room, dens, and also for bedrooms. Eggshell paint is washable and perfect for bedrooms, the family room, and the living room. Satin type paints will offer a great combination of both easy to clean and a moderate sheen. Satin paints are just a step above the eggshell in sheen, and may offer slightly better cleaning ability. They also perform and look great in nearly any room of your home. Many of the flat paints are perfect for non-reflective surfaces. A flat paint can be a perfect choice for larger rooms, large walls or ceilings. Flat paint will hide the imperfections on wall surfaces much better than higher sheen paints. Flat paint hides the imperfections and tends to spatter less when you’re applying them. Flat paints are perfect for low traffic areas like a formal dining area or a master bedroom or any room that may have more of a formal appeal. Flat paints are perfect for ceilings they use an extra spot a resistance surface and they hide imperfections very well. For more detail on paint finishes, click here to see our article on paint finishes. Specialized paints benefit from a variety of consumer insights. They utilize brilliant paint technology and allow specific types of paints for specific types of needs. Primer paint can be oil or water-based. Primer paint is utilized to seal the surface to be painted and prevent color bleed-through. Primer may be ideal for surfaces such as metal, wood tile or plaster. There are many all-purpose primer paints available with her perfect for two or more surfaces. If you’re painting in a room with high humidity you want to paint that is good to help resist condensation. Rooms that may have a high level of condensation include kitchens bathrooms, laundry rooms etc.. Anti-condensation paint is typically formulated to prevent condensation and it also includes a fungicide so there’s less chance of mold development. Fire retardant paints are to designed resist fire however, they will not stop a fire. They will, however, slow the fire down. They also prevent the fire from spreading quickly. It’s important to note that when you’re painting a room you may have to use more paint if you’re not using a primer. Primer would give the paint a solid coating and it will give the paint a surface to adhere to when you provide the second coat. You should be using primer if you’re going to be painting over a new wood or drywall, or you may be repainting over a darker or lighter color. Prior to doing this, you want to know the type of condition of the surface you’re going to paint. Whether the surface is going to use an oil or latex paint will be dependent upon the use of the room that you’re painting. If you prefer it all look or glossy look you may need to sand the wall or you may need a chemical de-glossing product. If you’re unsure of the paint surface you want to do a second coat just in case so always allow for enough paint for a second coat should you need it. This is just a short article on paint types. If you have questions or need some specific information, please give us a call at (719) 761- 5052 or use our handy contact form HERE.